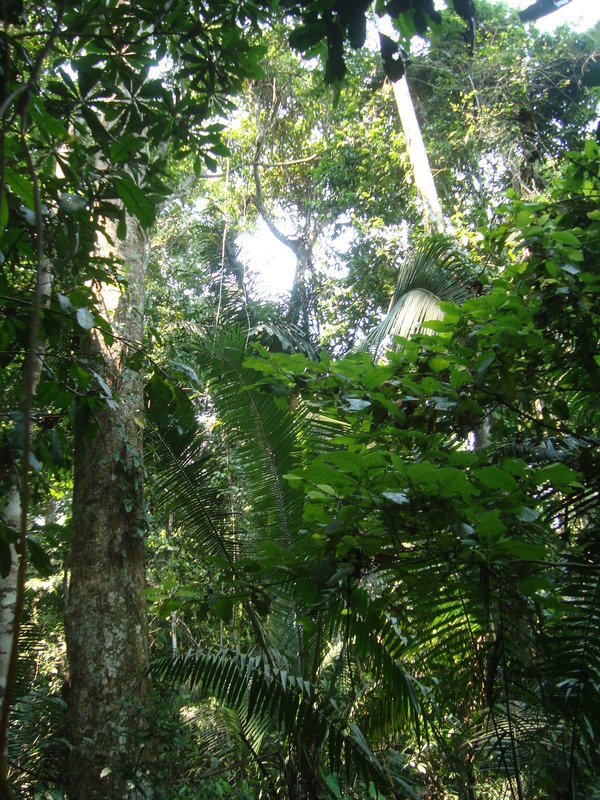 The Jungle Road – a long time ago! We set off for Lima but were soon concerned about the electrics – the dynamo was producing too much charge and was very hot – and that was after 5 miles! I decided there was not much to be done and if it went pop, the worst outcome was a flat battery. Some miles later we stopped to check and had a quick clean of the contacts in the Regulator Box – and carried on. 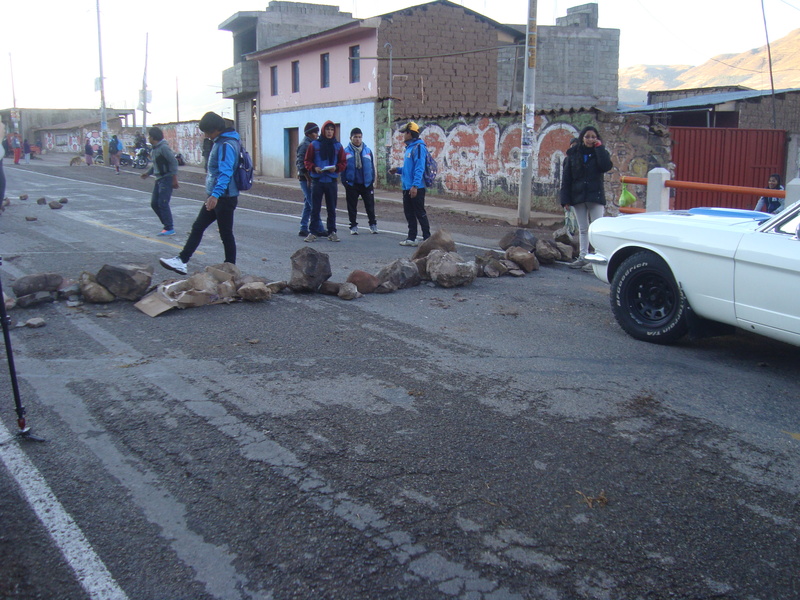 Some route adjustments to the Lima hotel; had been put on the windscreen overnight and when we tried to follow these, things took a turn for the worse. We got completely lost on a side street with hump after hump and the only way back seemed to be by crossing a busy dual carriageway – so I waited for a lessening of traffic and just drove across, hoping the oncoming traffic would prefer to stop rather than hit us! Allison then, for the first time, managed to follow the GPS and after we had settled our route I looked at the water temperature guage. Panic! The guage stats at about 9 o’clock when cold then climbs through 6.00 and generally settles at about 4.00 (about 90 degrees) – it was now at 1.00 so way off the scale but there were no clouds of steam. I stopped, blocking one of two busy lanes of traffic and leapt out, Allison gathering the warning triangle. Neither electric fan was working. Fortunately it was just a fuse problem but Allison had by now flagged down a passing police car and gesticulated that they should push us to a garage on the other side of the road. 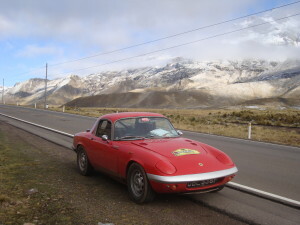 I restarted the engine, fans whirred, the temperature dropped, oil pressure rose and we reached the hotel as the first car to arrive (apart from the two which had driven up the day before). 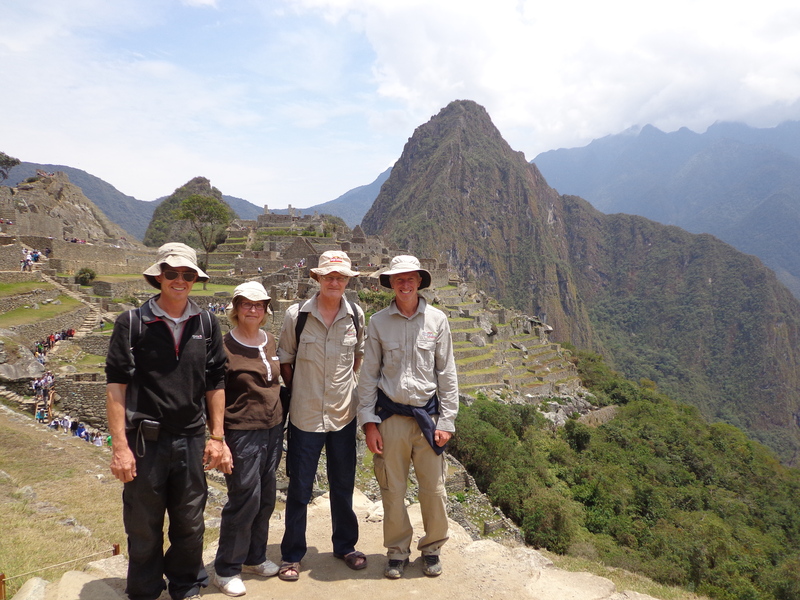 We were greeted by the camera, John, the organiser and a pisco sauer, the local cocktail. 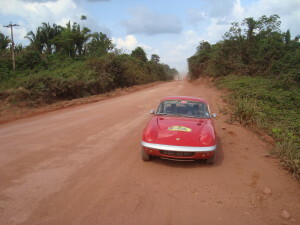 It had been a hard rally, the car had taken a pounding but was still running – just needs a little (?) time in the garage. In his “close of rally” speech, John identified the Elan as being rebuilt at least half a dozen times en route – a slight exaggeration but certainly on the cards now! 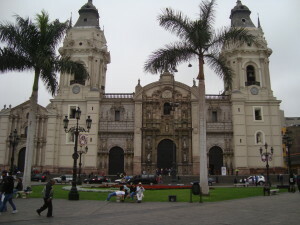 We did have time in the afternoon for a brief sightseeing tour of a very overcast Lima. 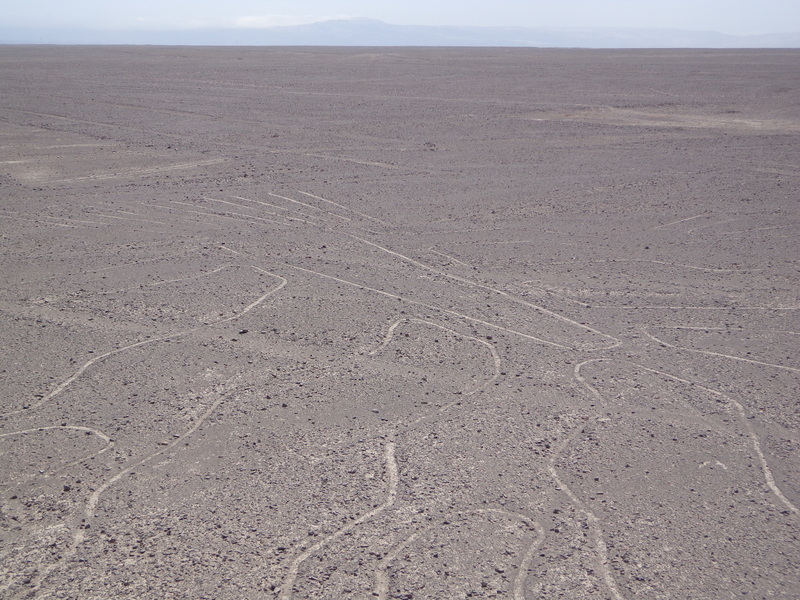 24 October This was to be the longest day of the rally – 780 kms and about 10 hours from Arequipa to Paracas – a beach and national park resort just north of the Nazca lines. 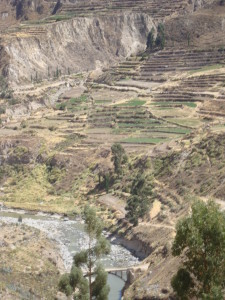 We left at 6.15, following a rally car out of town before he stopped to refuel then climbed slowly out of the dusty valley following and overtaking queues of slow lorries up winding narrow roads with plenty of hairpin bends. It took nearly two hours to complete the first 100 kms so we were well behind the average we needed to get in before darkness. 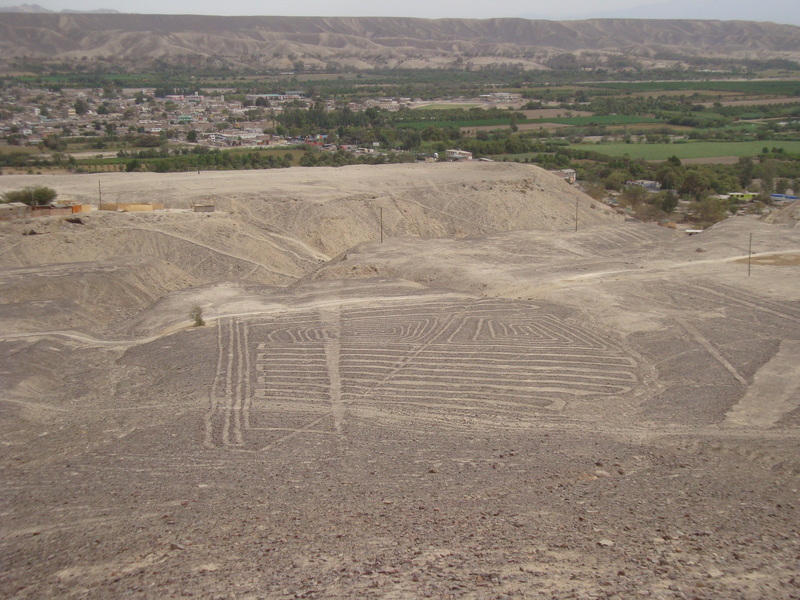 Is this the first Lotus to get to the Nazca Lines? 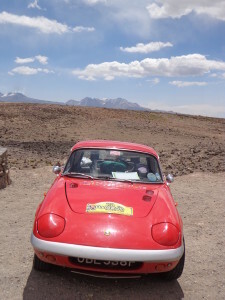 We reached our hotel at around 5.30pm, just before dark – a long day and the car faultless, appreciating the lower altitude and better quality fuel. 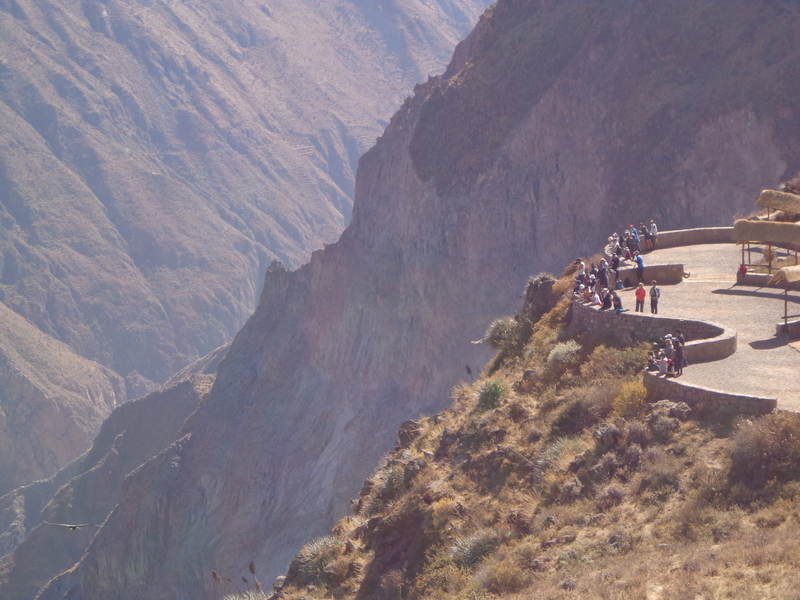 23 October Colca Canyon claims to be the deepest canyon in the world and is an important tourist attraction. 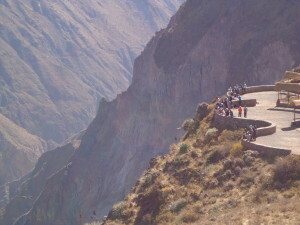 It is also home to Condor Vultures and one tourist trap is the Mirador Cruz del Condor. We had an early breakfast and the car was immediately affected by its own altitude sickness – revving engine and slipping clutch just to get up the incline from the hotel car park! We followed the rough track to the viewing area and came across this tunnel – and stopped. The tunnel was long, unlit, the track rough and there was no light from the other end. 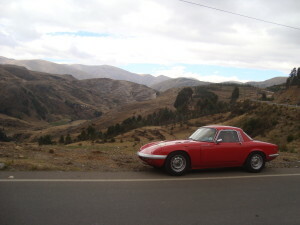 The Elan has vacuum pop-up headlights running off the engine but with the thin air there was little engine vacuum and the headlights drooped, casting their beam a few inches in front of the bonnet. We waited for a tourist bus and followed close this tail, following where he went, completely unable to see for ourselves. We waited for about an hour until the first Condor appeared – using the air currents to climb and circle with hardly any movement of their 3.2 metre wings. We retraced our steps, hitch a “tunnel ride” off another rally car.
. We retraced some of yesterday’s journey back over that pass – with a pause to cool down as the engine temperature reached 98 degrees despite the two fans. 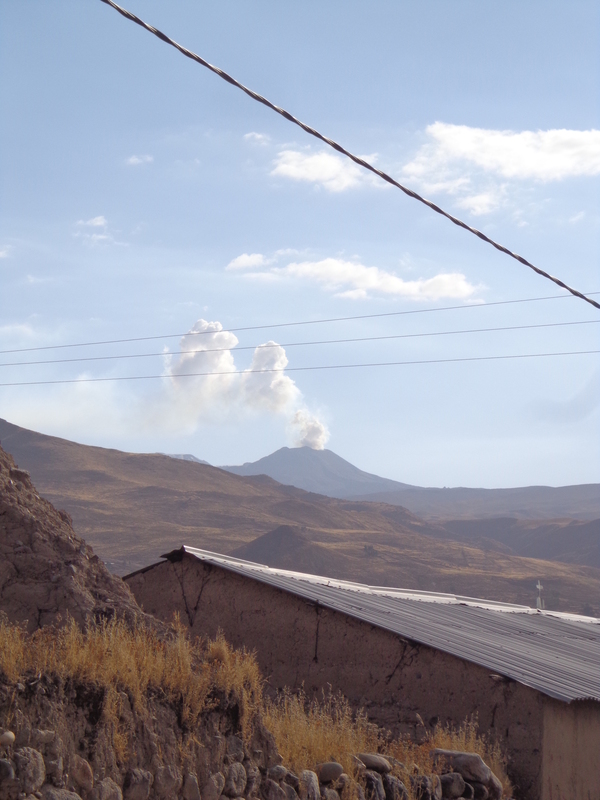 Our hotel was in Arequipa and in the desolate and dusty industrial outskirts we first lost electrical power and then I created an electrical fire when some wires short circuited. I put that out at the cost of burnt fingers, the power was restored but Allison, in manoeuvring the fire extinguisher, tried to extinguish the front wheel! 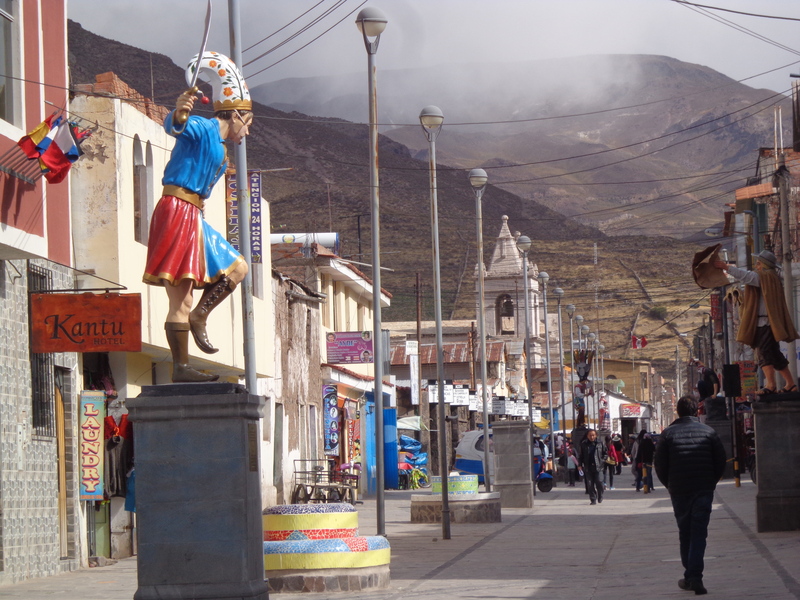 There were no more dramas and we followed another rally car through the town to the hotel as Allison decided she could not cope with the navigation. Later I was very ill and did not look forward to tomorrow and the longest da’.s drive. 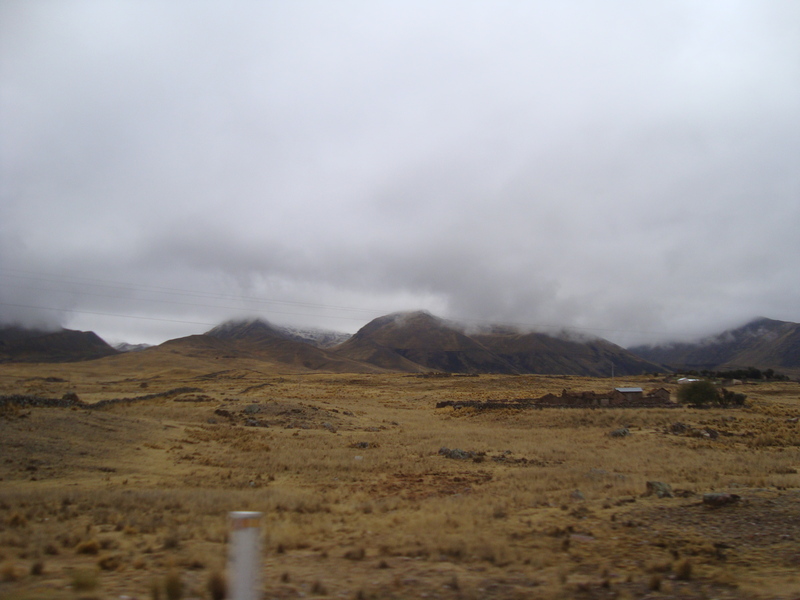 22 October We left Puno for the mountains at Chivay after wiping the overnight frost off the car – it had been -5. The rally was split today; we were strongly advised to take an alternative route to avoid a 30 km section of old un-maintained track, with serious rocks and ground clearance worries – and the unanimous consensus was there was no way we could have got through. We took a longer route, with one organiser’s 4WD and the Sweep all to ourselves! Each car had been given an oxygen cylinder when we left Urubamba as we would be climbing to nearly 4900 metres and today we would remain at a high altitude overnight. 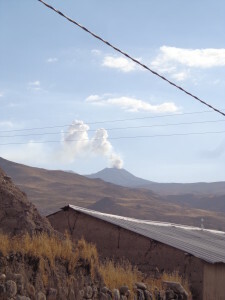 volcano. Our hotel was on the edge of the Canyon and had its own thermal springs – with water at 90 degrees. Allison went for a swim whilst I went to the Alpaca farm – the Alpaca bloodline had become contaminated by interbreeding with Llamas and between different colours of Alpacas. The hotel was part of a project to rectify this. as the protests were limited to Cusco district. Desite going quite quickly and getting an early start it was dispiriting yet again to be the last home, shepherded by the Sweep. 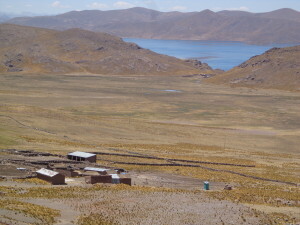 So now we are at Puno on Lake Titikaka and Allison will go on a boat trip to the floating islands whilst I do a check of every nut and bolt on the car! 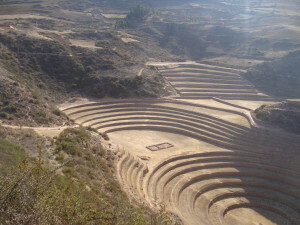 20 October So we set about the clutch at 8am with the idea of finishing by 9am so we could go to Cusco – it didn’t work out like that! here was a smell around the car and some slippery liquid on the sumpguard and the ground. The clutch slave cylinder had died; fortunately we travel with a spare but removing it is a messy and awkward job. We found the source of a rattle and fixed a light but still no horn. 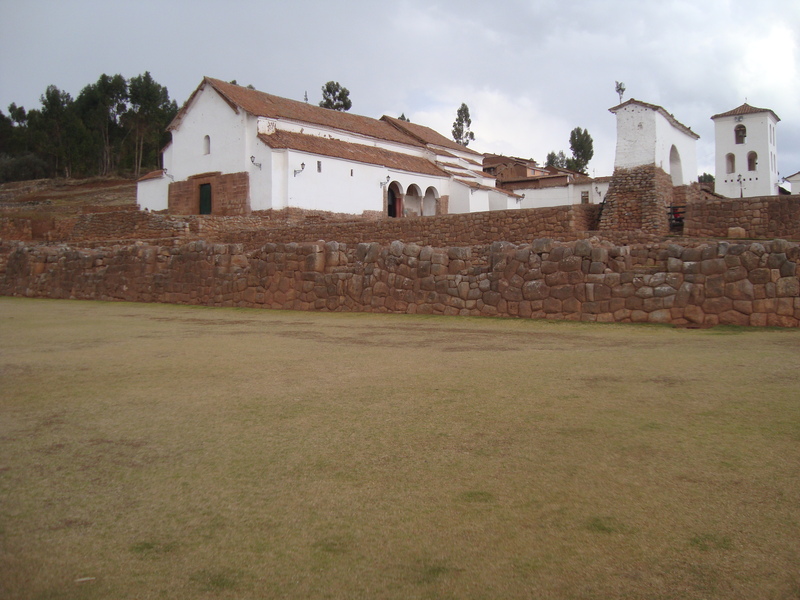 At around 11.30 after a shower we set off but not to Cusco as “events” had intervened. 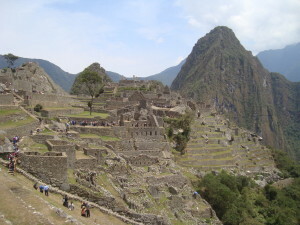 My understanding is that there is a proposal to privatise Machu Picchu and there are going to be mass protests in the whole Cusco region tomorrow – closing roads being part of it. Moray – but what was this for? 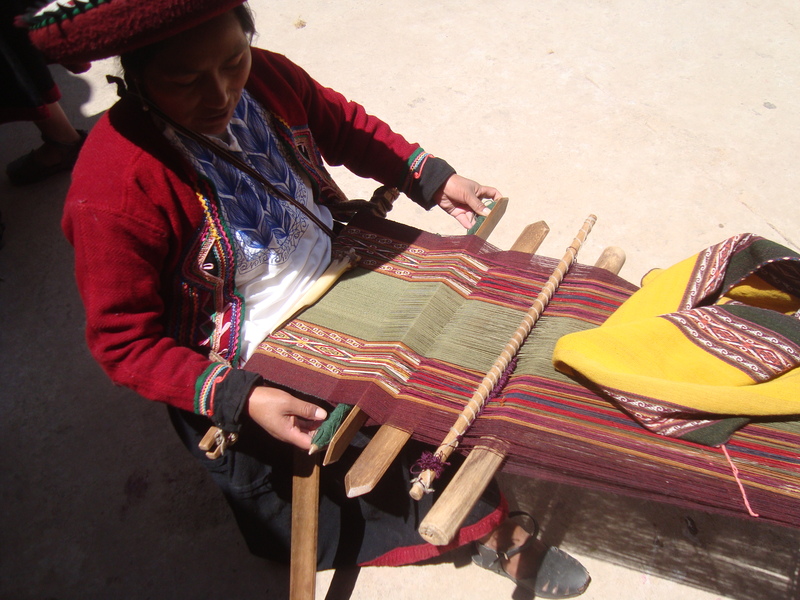 as well as going to a weaving exhibition (aka buying opportunity); in case there was a call to make a dash this afternoon. The rally organiser has arranged a meeting for later this evening to advise on what we should do about the protests – a 3.30 am start being one option! To be continued with photos! 19 October Today was a Rest Day but probably more tiring than most rally days! Up for breakfast at 5.30 then to congregate at 6.15 to go to the station for the train to the Inca City now known as Machu Picchu The train crawled along the river bank at maybe 20 mph (and that’s optimistic) with high mountains rising almost vertically. 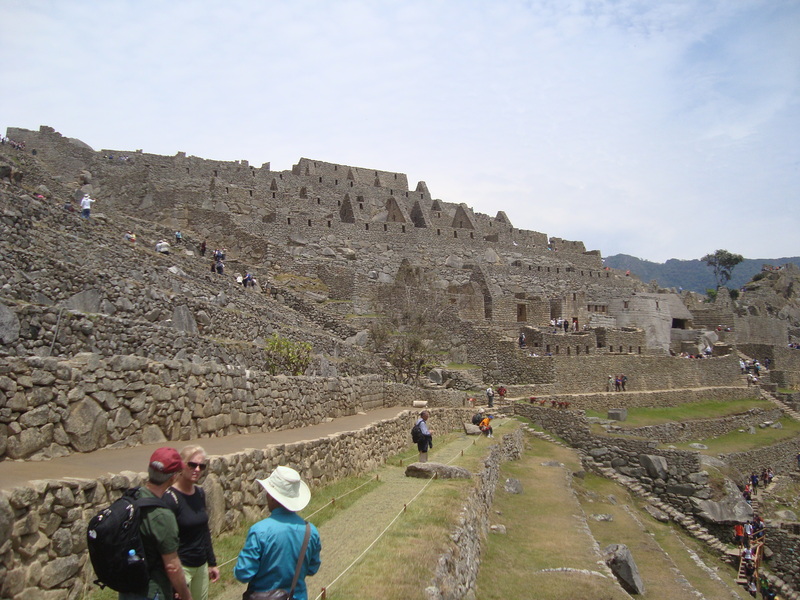 The guide book says to arrive before the hordes at 9.30 – we were part of the horde! There were queues for entry tickets, then for bus tickets, then for the bus. A fleet of busses carry visitors uphill for 25 minutes to the site, no private cars are allowed as there is no parking. 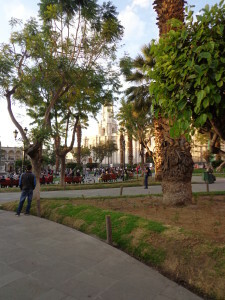 We hired a guide and were taken round the City which, despite its fame, only functioned for 85 years was deserted before the Spanish Conquistadores arrived and rediscovered by American Archeologists in 1911. The train ride back to our hotel was “different”. 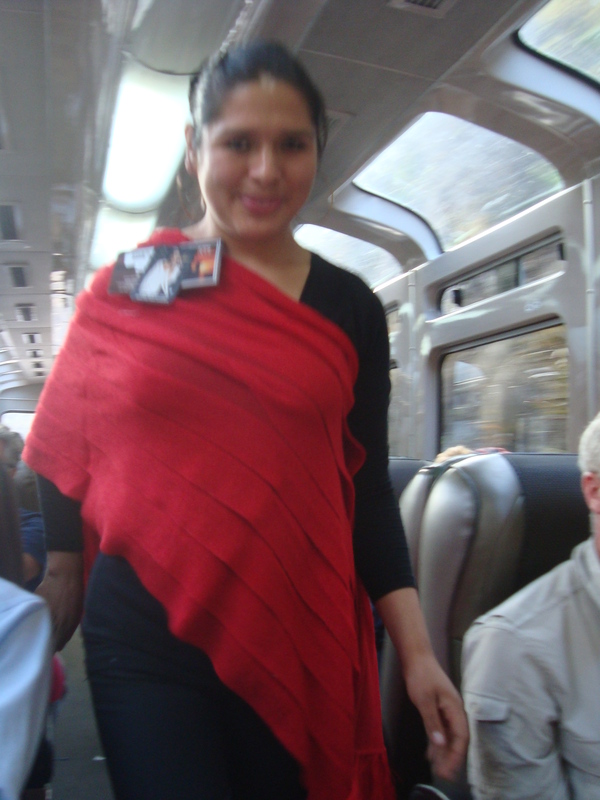 They have tried to make this service 0f Peru Rail like an aeroplane – drinks and snacks are served from an airline trolley (complete with instructions to stow before take off and landing! 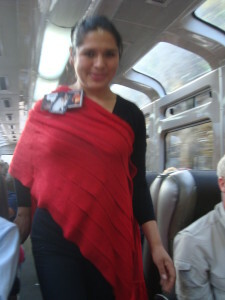 ); on the outward journey they came round with glossy tourist books of the site but on the return one member of staff dressed up in a mask and costume performing dance routines whilst two others modelled a range of Peruvian cardigans and ladies woollens which we were then encouraged to buy – I’ve never seen a fashion show on a railway train before! We got back to the hotel at 6.30 and, no, I did not look at the car’s clutch today! 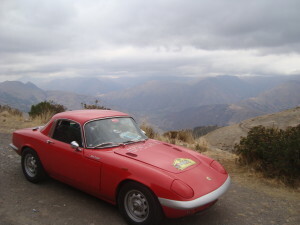 18 October and we drive towards Cusco, today was 300 miles including a climb from 100 metres to a pass at 4,800 metres. For a change it was a cool day – very pleasant after all the heat we had earlier There were discussions as to whether the drivers needed oxygen and, in our case, if we should have brought different “jets” for the carburettor to cope with the lower oxygen density at such altitudes. In the event we had neither! 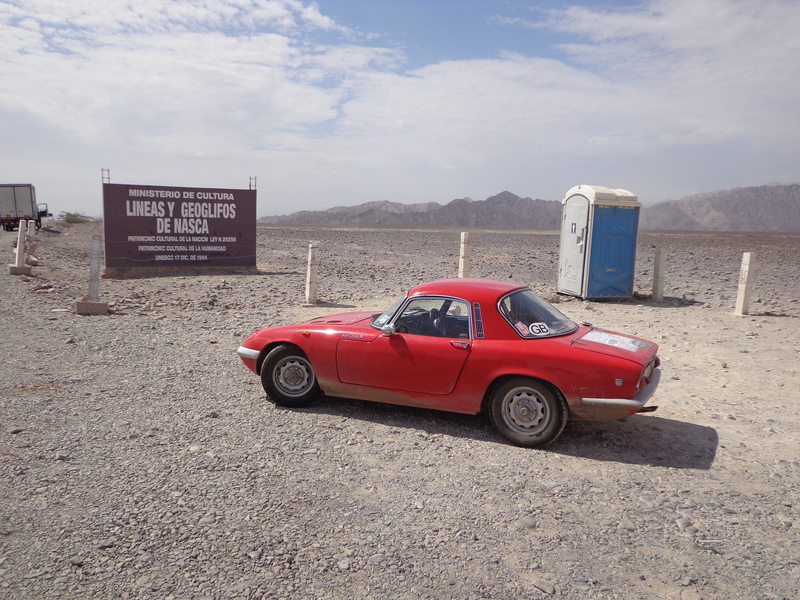 The first half of the drive was fine – though the car was unhappy above 70 mph which I guess was fuel related. We passed villages busy with markets and women in traditional clothes which they really did not want photographed. Then we started to climb. All’s well that ends well but it was stressful at the time. First there was a smell, then the clutch pedal went straight to the floor, then it became foggy with little visibility so I put the lights on, then the car reached boiling point so we stopped. The smell was electrical and Allison saw smoke coming from the regulator box; the dynamo was too hot to hold. I decided that the electrical system was overburdened by the two fans, lights and wipers and hope that we had stopped in time to prevent fatal damage to the dynamo – they cannot cope with excess load and Lotus electrical systems are notoriously suspect! The clutch problem I think was boiling fluid as the cylinder sits very close to the exhaust – and that was certainly hot. Outside the car it was cold so we soon had trousers over shorts, socks with our sandals and two fleeces over our short sleeve shirts! We cooled down, turned off the lights, double declutched to change gear (or just crunched) and carried on in 2nd gear to the top. not 4800 metres but close! 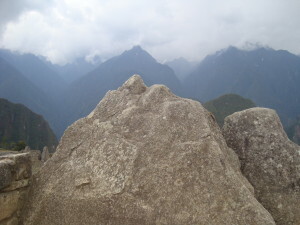 We assume we got to the top because we could see nothing, but the engine said life was now easier! 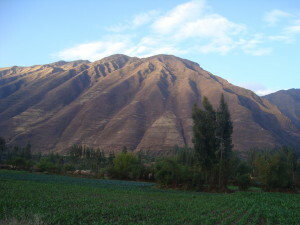 We reached our hotel in the sacred Inca valley of Urubamba – in visiting distance of Machu Pichu (tomorrow ) and Cusco (the day after). At some stage I will need to tackle the clutch – but not today! 17 October – Rest Day in Puerto Maldanado so just after 6am when it was still cool and there were no crowds, I set about the points, then breakfast. 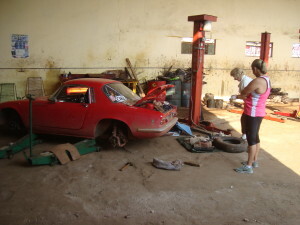 Our next tasks were to refuel, get the wheel balanced and the car cleaned – the dust inside being the more important. The tyre balancer had a dedicated cleaning service and for the princely sum of £7 we had a clean car with a balanced wheel! By now (10.30) it was seriously hot – 34 degrees with very high humidity and doing nothing we were dripping. 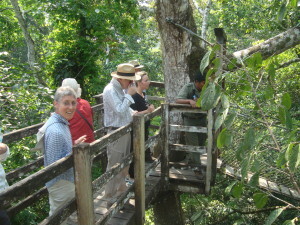 We had signed up to a Jungle canopy walk in the afternoon so at 11.30 we were collected in a beautiful old Charabanc. Based on a 1960s Ford it had 24 wooden seats – all with lap seat belts! 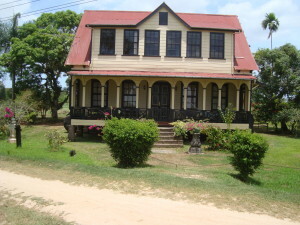 – and a wooden surround holding the roof. Then a boat trip to the Jungle Centre where one could rent private lodges and have your meals served in a dining area covered with fly nets 30 metres above the jungle floor. Our walk started in “primary” jungle where only 2% of sunlight gets to the ground – that 2% was enough for me and I was debating at what stage I would start drinking my shirt it was so wet! 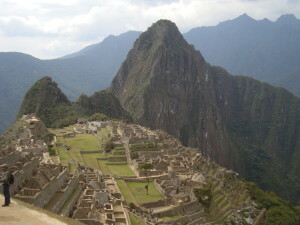 Then up a 30 metre tower and over rope walkways – though the view was limited. 15 October I woke up early and decided that the “turret support bar” was contrary to the fundamental concept of Lotus handling (flexibility not rigidity) and that anyway there was no evidence of any damage to the turrets – so I removed it! A 6 hour day to Rio Branco lay ahead and the last night in Brazil. 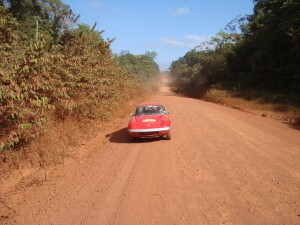 In principle the roads were good – tarmac all the way – not quite! The steering was awful and we tried fixing the tracking at the hotel before leaving (tracking is to make sure that the wheels are all pointing the same way!). Whatever we did, it didn’t work so I stopped at the roadside for another attempt. Toby decided that one wheel was buckled and was giving wrong readings. We changed to the spare and the car was much happier – but both front tyres were wearing badly and did not look as if they would last the journey. It was a hot day – very hot and the car was soon saying that the temperature was about 95 – I alternately slowed and coasted to manage the temperature and eventually found the only tree for miles around where we found that the original electric fan (thermostatically controlled) was not starting – so it was “hot wired” (in both senses) and we were on our way again. 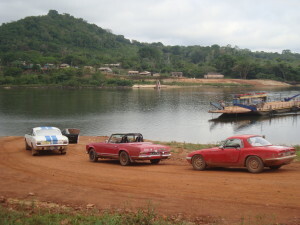 The road deteriorated and we spent time dodging potholes Ferry crossings are a daily staple in Brazil and the Lotus was the centre of attention with a member of the crew saying that he had seen the Mustang and another classic (the Mercedes). 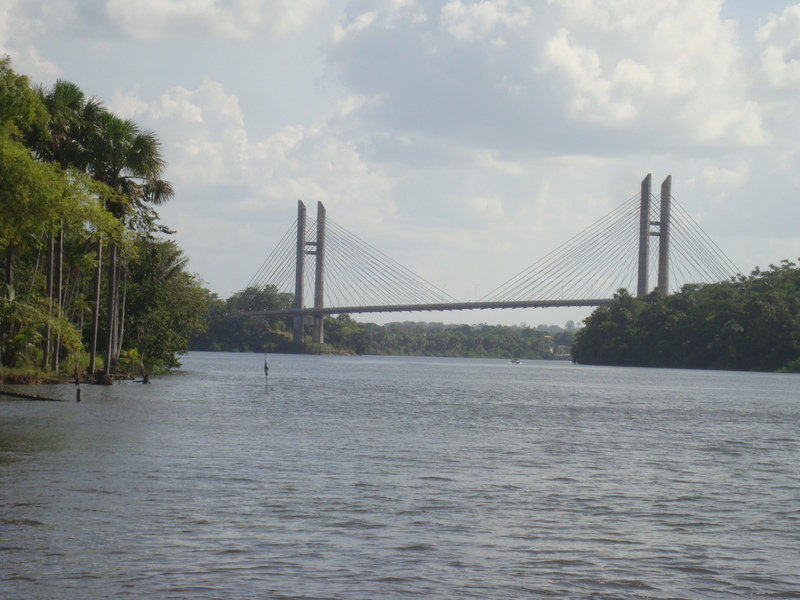 We reached Rio Branco just before dark – success! The hotel Manager was very helpful in tracking down a tyre vendor who had (nearly) the right size tyres and said she would guide us there next morning at the special opening time of 6.45. 14 October. 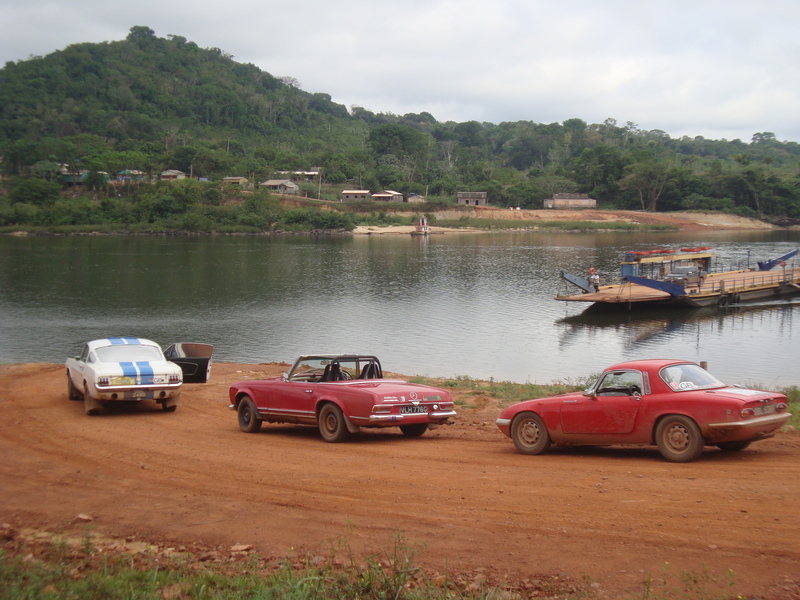 Rest Day in Porto Velho – We left the hotel in convoy at 9am to find a workshop where the Mustang could be welded and the Elan examined. The Mercedes only needed a ramp for routine servicing and inspection.. Unintentionally, that is where we started off as our requirements had got lost in translation. We shuffled from workshop to workshop but none were quite what we wanted. Eventually we found a tyre fitter with ramps and a welder/machine shop next door – this was going to have to do. It took ages to tell the welder what was needed and the persuade him that it was feasible. 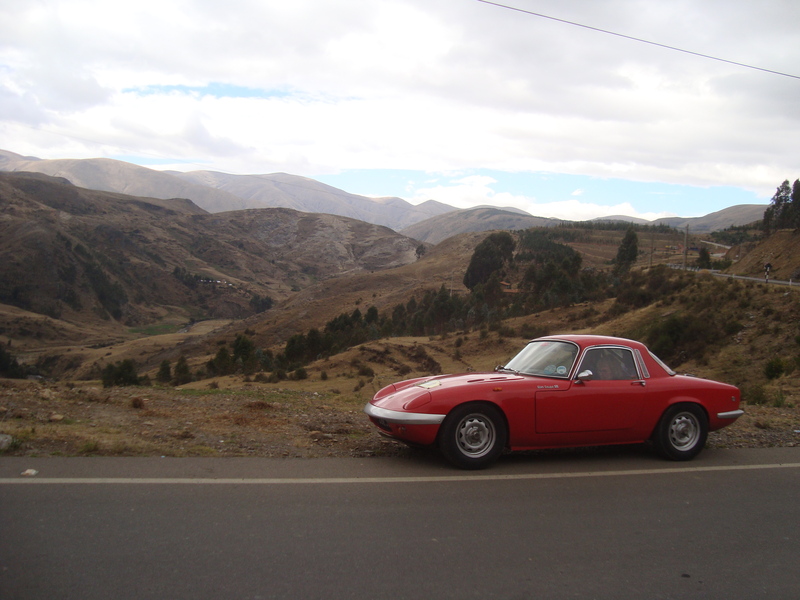 Then ton look at the Elan. The chassis which we thought had suffered looked ok but the “vertical link” (also known as kingpin which holds the front wheel in place) was bent. Allison had bought one of these some years back and I had brought it with us on the grounds that it might be useful – but I thought it was the nearside. 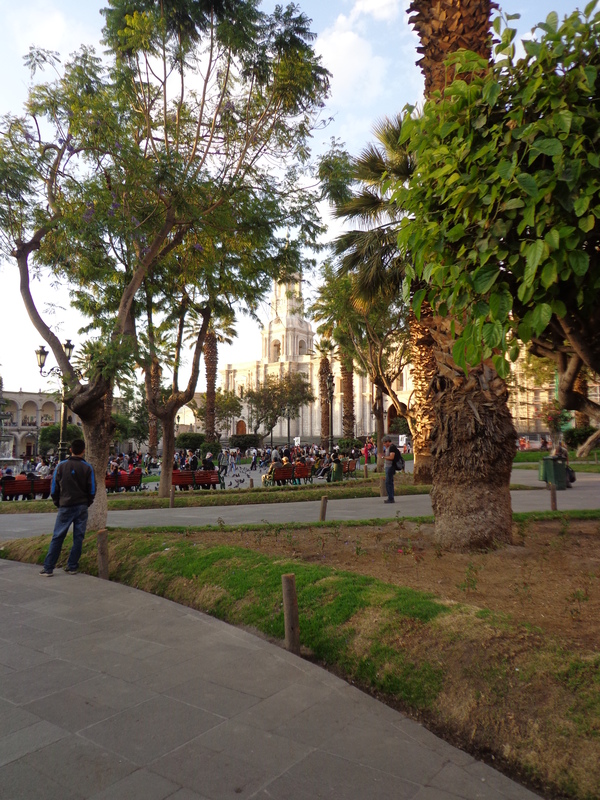 I went back to the hotel – and – result – it was the one we needed! Elation! I also had a spare stub axle so the plan was to rebuild that “corner” of the car and to manufacture a support bar to join the two front chassis turrets to give extra strength. Frustration rapidly set in when it transpired that the brand new Lotus part had the wrong size taper to accept either stub axle. To cut a long story short we left the workshop at about 6pm to go back to the hotel where we fitted the “turret support bar”. End of Rest Day! 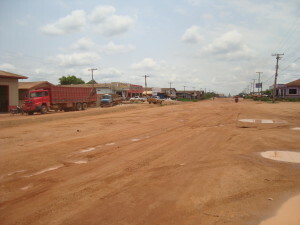 13 October Our long day with 400kms on dirt plus another 200 on tarmac. We got through but at a price – I hit an unmarked speed bump, the car bounced over it but the front suspension is now bent so on the “rest day” on 14 October its off to the workshop to see what else is damaged and how to stabilise the position. The car is still drivable – we did about half yesterday’s distance after the bump. One front wheel is at an angle and steering is less than perfect! 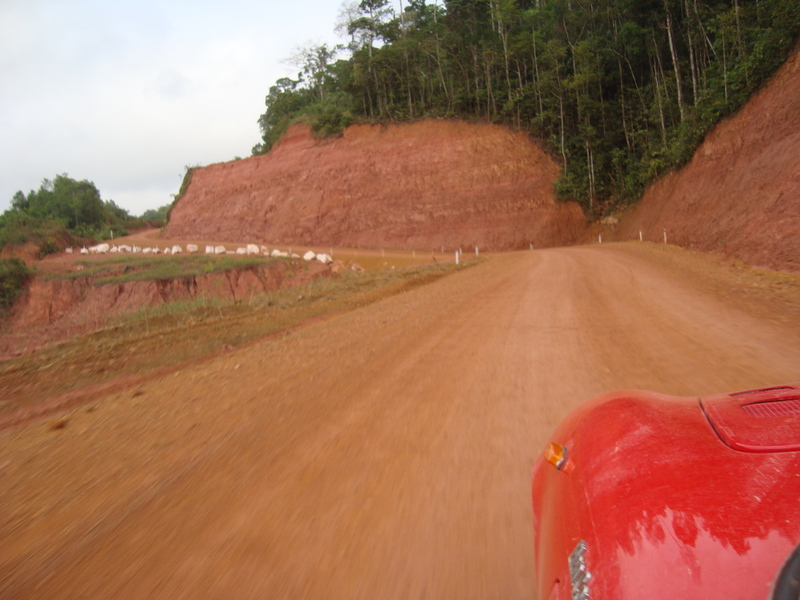 The day started early with a mostly good quality dirt road where we were easily travelling at 60+ mph The good pieces were interspersed with bad pieces – potholes and bumps and muddy pieces where the car struggled to keep on a line as the mud pulled it around. There were also road crews so maintenance was on-going though this is the first time we have seen them in action – dirt roads need constant grading to flatten out the heaps of gravel which mount up between the tracks created by the 4WD’s and lorries – and we hit if we try to follow these their tracks. 11 October We left as early as we could after a short breakfast. 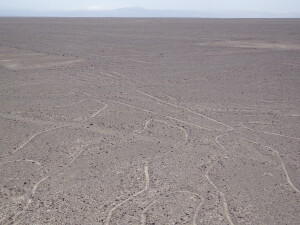 The entire day was on baked mud. 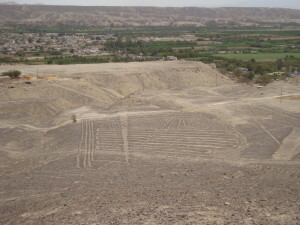 We were covered in dust, us, the car, all luggage, everything; it accumulates on any exposed flesh and clothes, its persistent and will not be moved! At times we had to go offline into damp mud which clung to the underside of the car, thick, heavy and stubborn. 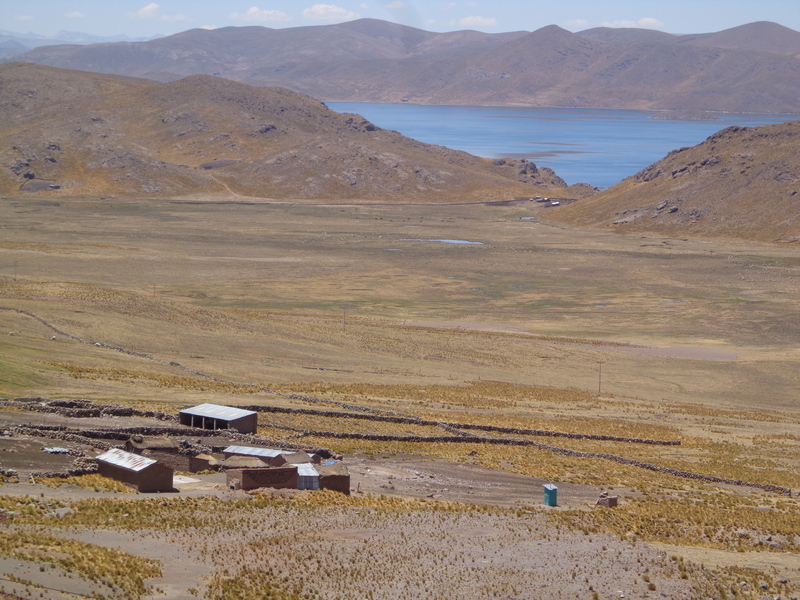 It was a long day – photos but the internet speeds here do not permit a download. 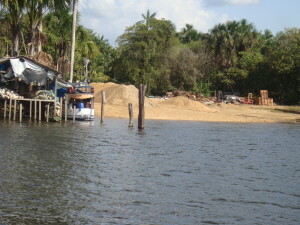 We arrived in Jacareacanga in daylight (just), and found more mud in the hotel car park. We had rattled and banged and clattered our way and were far too often and unexpectedly hitting the ground with our sump guard. The “road” – Trans Amazonia Highway – to give it its proper title tended to have one track – at 4WD width. This was no good to us as if we tried to follow this track we rode on the raised gravel in the middle and the noise alone is enough to tell one this is not a good idea. So we go offline and hit all the bumps and uneven surface at the edge as well as having to fight the gravel mass in the centre which wants to dictate where our wheels should go. We hardly used 4th gear all day. he front suspension seemed unusually flexible -there is normally no up and down movement. I started my evening checks there and found that the “adjustable spring platforms” had self adjusted downwards thereby lowering the front suspension. One beer later, I had raised one side and was part way through the other when John, the organiser, and Toby, the mechanic, twisted my arm to suggest I join the Mustang at a local garage where there was a ramp and we could see what the damage was (if any) and avoid grovelling at ground level – so wee went to the garage. This was a social occasion, children, wives, girlfriends arrived to see these two cars, loud music played, the BBQ smoke drifted across the dirt floor, locals wanted photos with the handsome strangers (?) and our rally photographer wanted an interview as to why I was here and what I wanted to achieve. The Mustang had a broken axle and drive shaft so needed copious welding. We just needed some minor tweaks, a few lost bolts replacing and time to let everyone marvel at the amazing resilience of this most unsuitable car! 10 October Leaving the ferry after two nights on board was less dramatic but we were away fabout 4 hours later than expected – first on means last off! The day started with fast tarmac, followed by potholes in tarmac followed by no tarmac. 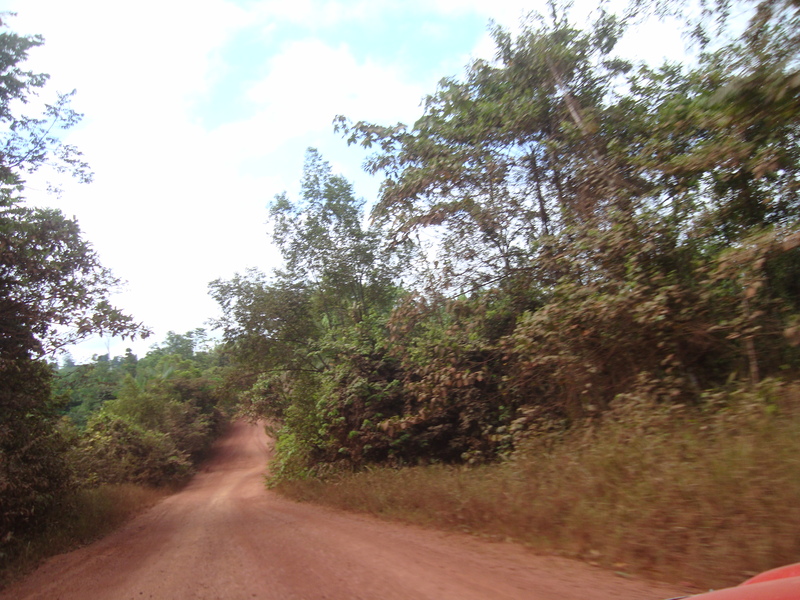 The last 150 km was mostly tracks of baked dirt with potholes, bumps, washboard, bridges, a few goats but little traffic – and another ferry. The photographer spent a long time filming the Lotus from the 4WD – the two other classics are going faster than the 4Wd’s so he hardly gets to see them! It was another day when we were hot, sticky and dirty – the dust gets everywhere, But after all the shaking on the road my first task was not a cold beer and shower but an hourdoing a spanner check to see which nuts and bolts had come loose. Tomorrow promises fewer miles but less tarmac so another long hot dusty day! I will try and get the pictures up when the internet speeds allow! 8 & 9 October On 8th October we had the morning free in Macapa to see the sights or buy spares for the cars before taking the ferry to Santarem. We did both, firstly visiting the old Portuguese fort, built to protect the City from the Amazon (pictures to follow but internet speeds in Itaituba are very slow!). Then to buy a second electric fan. This took a long time and if I tell you that the taxi fare was more than the fan you will get the picture! Anyway a fan was acquired. 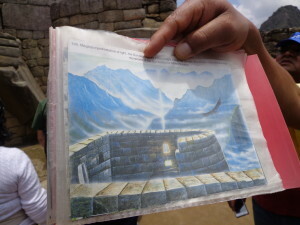 Then we left for the ferry via the Equator line which runs through a football pitch and has a monument with an Equator line, guides and a visitor book – just that there are opinions that the monument is off centre and the actual line runs through the car park. 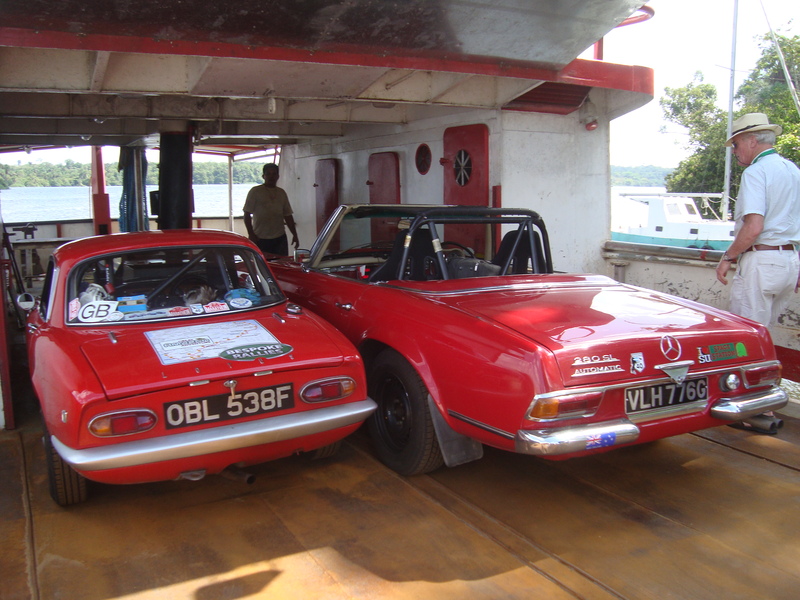 Then to the ferry – an excellent example of the rally motto “hurry up and wait”. The Lotus was the attraction whilst we waited. 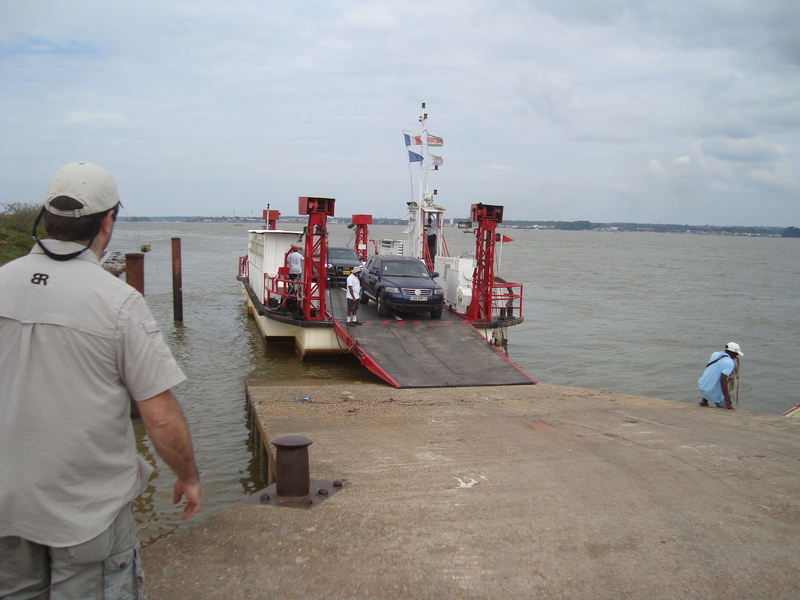 Then loading was even more exciting – we had to go over a ramp between pontoons and there was no way the car could clear the ridge in the middle – so we used a seesaw! 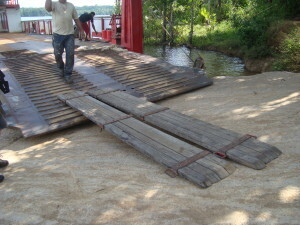 I drove up onto 2 planks then moved slightly forward, shifting the balance point, the planks went down the other side and I drove onto to other pontoon. 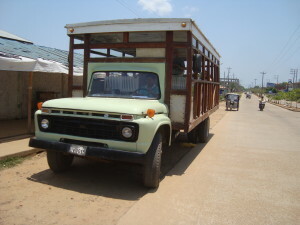 The cars were crammed into the lower deck along with household goods, freight, fish, a caged dog, frozen fish and later furniture and a satellite dish. 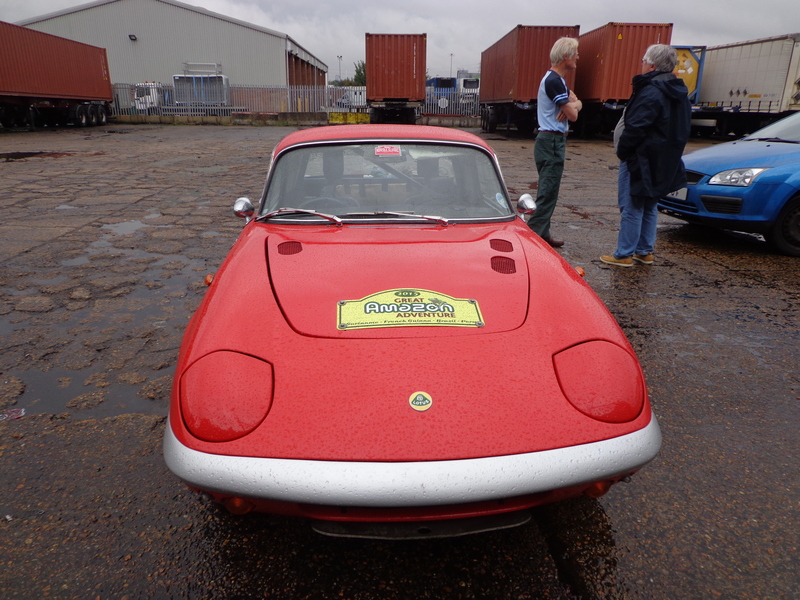 The Lotus was given more space than any other car so Toby and I were able to spend most of our sailing time fitting the fan, repairing the doors (they don’t like being shaken) and eliminating the brake squeal which has long been a feature of the car. It was hot but with the shade and breeze it was as good as we were going to get. We finished all the tasks and they made the next day’s driving much easier. The car now has two electric fans strapped to the radiator – one the nice Kenlowe with thermostat controls and proper fixings and then the new one with a Toby “special bodge” – its held on with tie-wraps running through discarded bottle tops and shavings off the planks – to prevent the tie-wraps bending the fragile radiator fins. 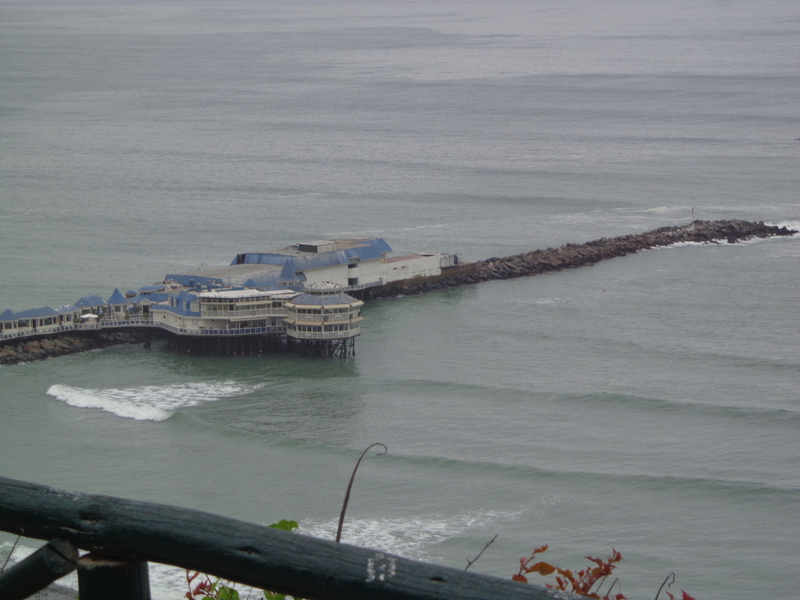 7 October – Today we hit the rough stuff! 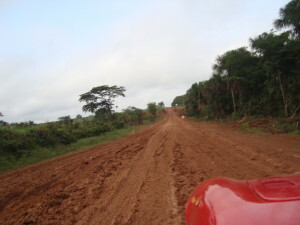 This section was good and fast – except when you were overtaken because then you could not see through the clouds of dust but the surface was good – the potholes came later! We had about 100km of this and the car was shaken and everything covered in red dust. The engine was running at about 90 degrees most of the time and the oil pressure slightly below where I wanted it. Toby, the mechanic, fixed the wiring on the electric fan at lunch but it still ran at 90 afterwards! 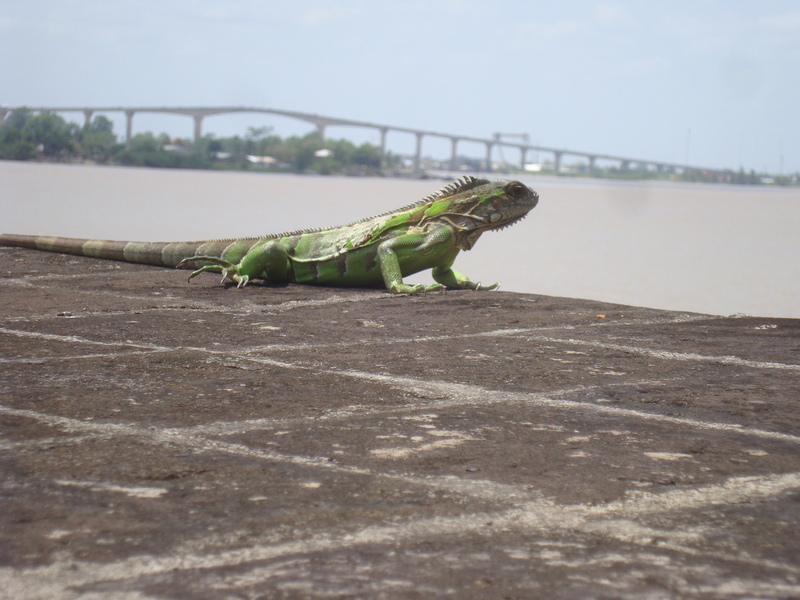 We were relieved to arrive in Macapa after 9 hours on the road. 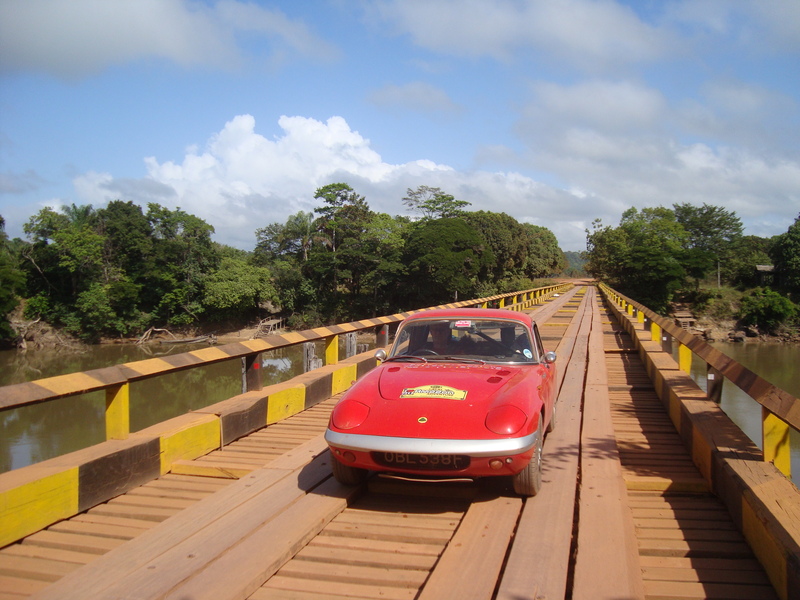 We were hot, the car was hot, the engine lumpy (Brazilian fuel), the underside battered and the doors wouldn’t open or close – 9 hours on the road was followed by 2 hours in the underground garage, wiping sweaty forehead on oily rags, checking nuts and bolts. Tomorrow we start our 2 day ferry up the Amazon with time on board to rehang the doors…..and see if I can get some video onto this report! 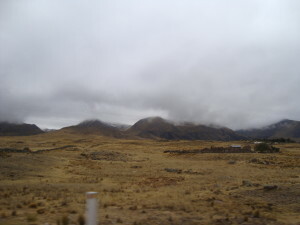 6 October We set off in a slight drizzle – oh bliss – rain is cool and for once we are not being steamed in the car! It doesn’t last for long but does leave a wet dusty windscreen. 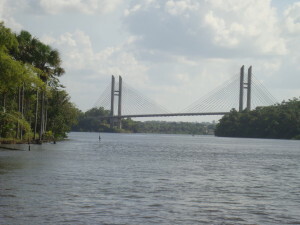 Our destination is St Georges and the river boundary into Brazil. Passport control is in a small compound away from the river and we arrived at midday just as they had gone to lunch – so a 2 hour wait, fortunately the ferry was booked for 2.30 so lunch in a beautifully faded French style restaurant with a few lazily twirling overhead fans was called for. had met a local Europa owner in Surinam as we were leaving but nothing in French Guiana. 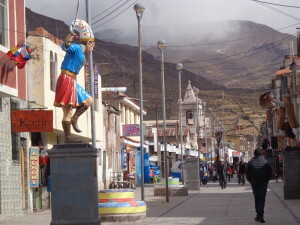 Oiapoque as a small town but much more bustle and activity than we had met before. 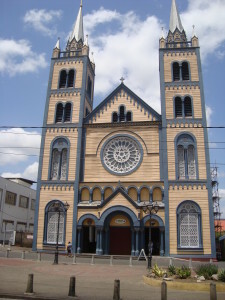 French Guiana used Euros but we now needed Reals but the bank with all its security entrance and armed guards did not do exchange and neither did the Cambios (closed) and as I didn’t want to buy from a money changer in the street – that had to wait! 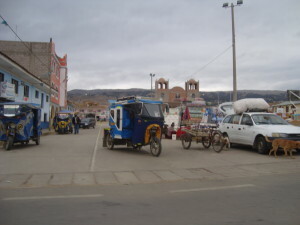 Our hotel was just off the main street and we parked on the forecourt, hemmed in by the 4WD’s which parked in the road. It was arguably the worst hotel we have used since student days but they did an unexpectedly good breakfast and we left before 7.30 next morning. 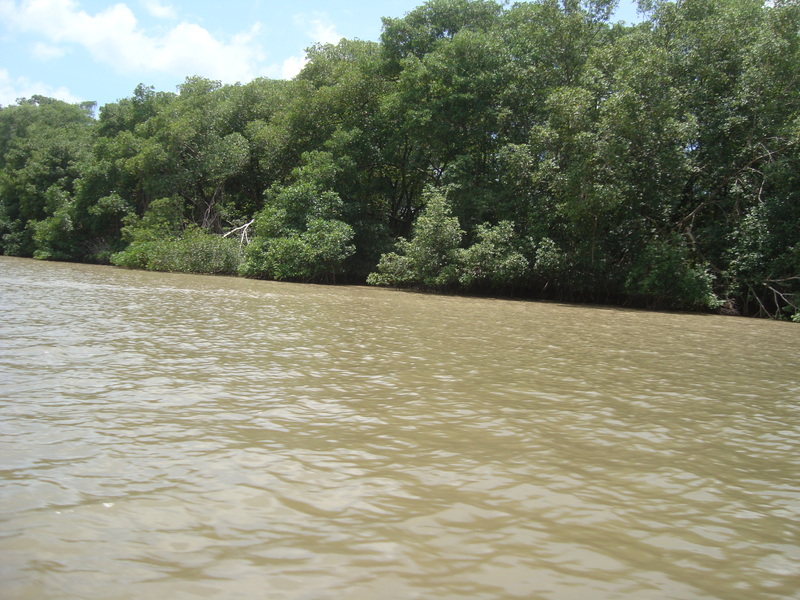 5 October – Kourou is a seaside resort and its far too hot to do anything outside – a short stroll down the beach leaves one dripping. 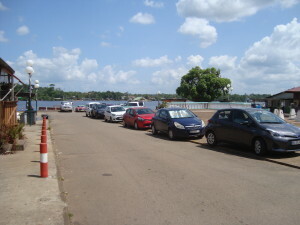 The car is parked under the only available tree with the others clustered around. 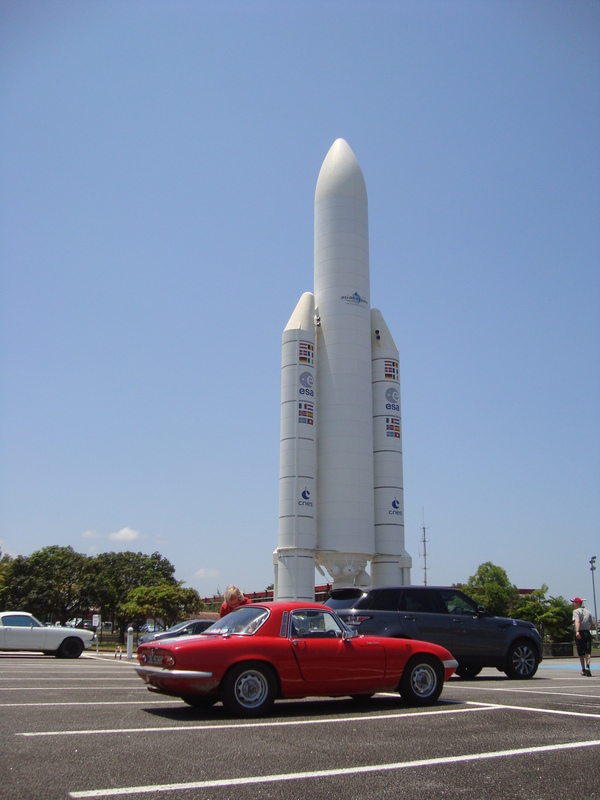 At midday we set off for the Ariane Space centre just 10 miles away. 4 October A civilized start of 10.30 and we headed off for the ferry to French Guiana. Two cars were stopped for speeding and one of the 4WDs lost his air conditioning. 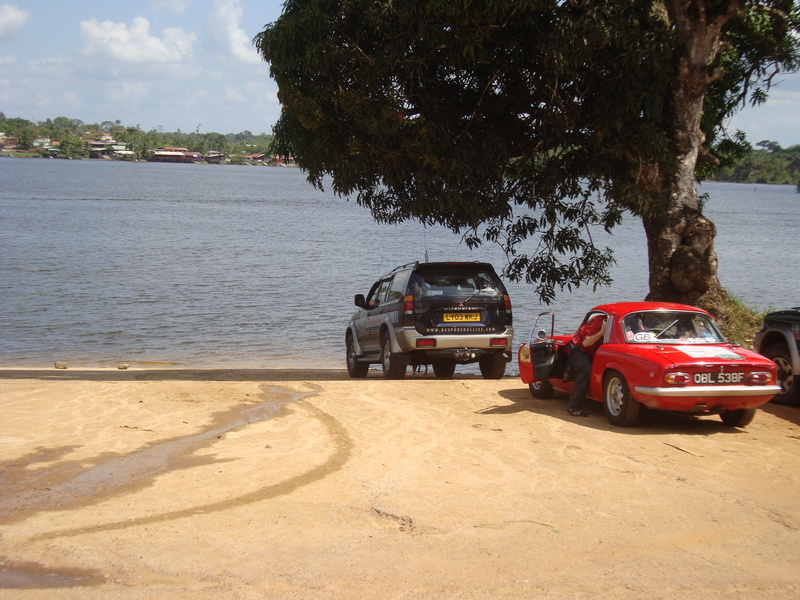 We arrived three hours ahead of the ferry departure to allow for Customs clearance – this was relevant as we had paid a 2,000 Euro import deposit to the Surinam Customs and would rather like it back! 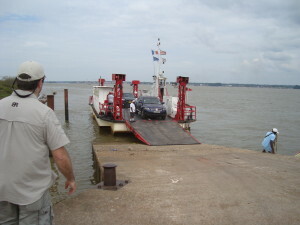 The ferry had enough space for 8 cars and two motor bikes so one of the organiser’s cars had an hour’s wait for the next ferry – being French there was a lunch break of a couple of hours! 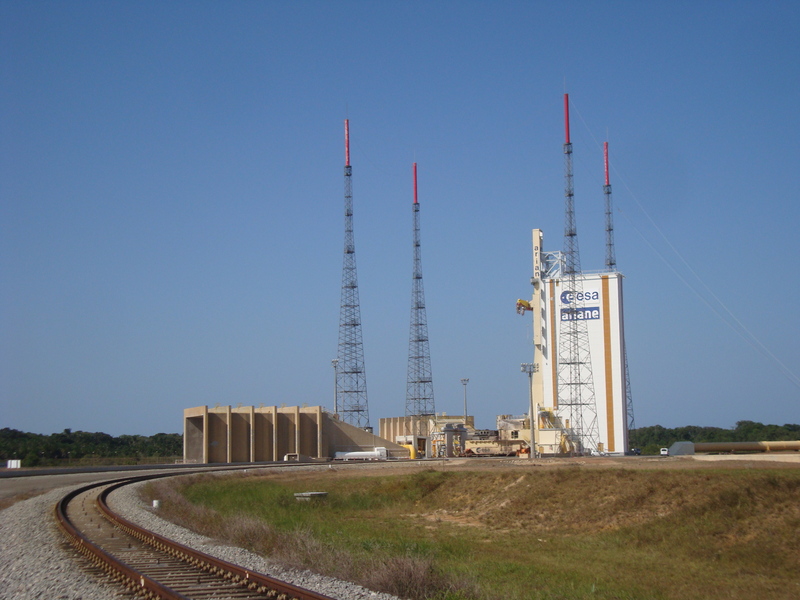 The road to Kourou was fast and clear and not a gendarme in sight; we arrived just before dusk. 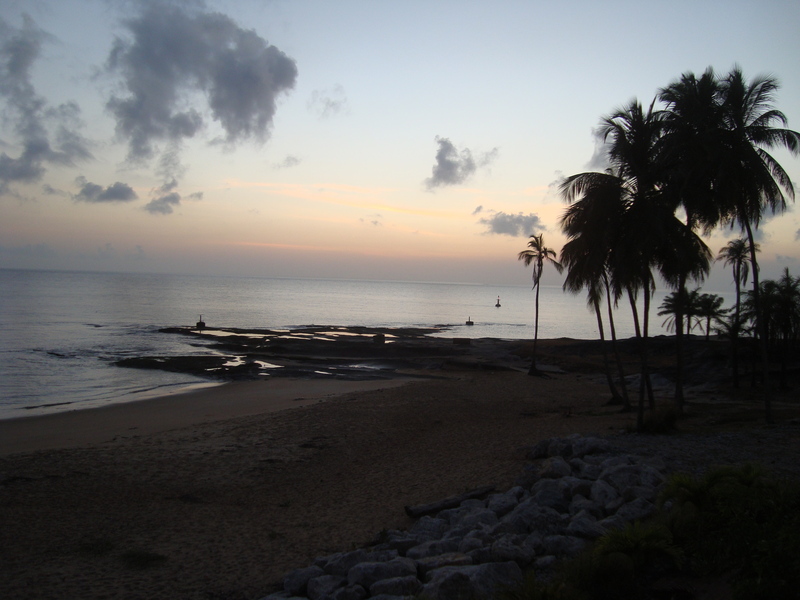 being so close to the Equator, the sun rises at 6 and sets at 6 – regular and predictable.
. During our evening meal a deputation of 4 gendarmes arrived to tell us to move our cars from the communal parking to outside the hotel foyer for improved security – so we duly obliged. 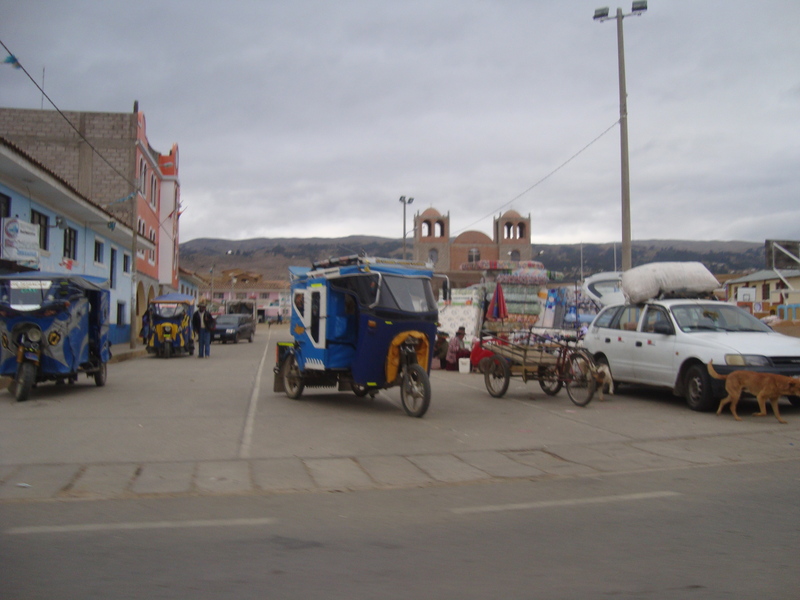 Next morning, as the first down I was harangued by the hotel manager demanding to know why we had parked in front of the doors, saying it was a safety risk and threatening to bring a tow truck to take us all away! One driver had 3 more gendarmes at his room door demanding he move the car immediately – they sure know how to impress their guests at the Hotel Des Roches! trip to Fort Amsterdam and an old coffee/cocoa plantation. The Fort had a museum to slavery – the end of which killed off the plantations which were no longer viable. In the evening we were asked to go to a local car rally as the subsidiary attraction but we were taken an hour too early so all gave up and went back to the hotel bar. 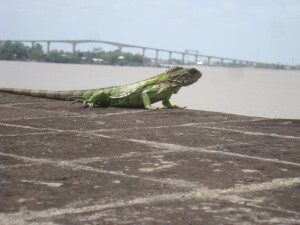 Easy flights to Paramaribo and now we and the Elan are seeking a bit of cool in 36 degrees! The car brought some of the UK damp with it and there was mould on the passenger door and rainwater in the socket set in the boot. 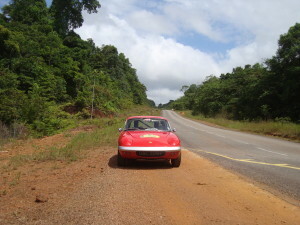 Car started first time out of the container and the only problem was a broken passenger side wiper blade – we may not need it in sunny 36 degrees – but this is the Rain Forest so can’t expect unbroken sunshine! 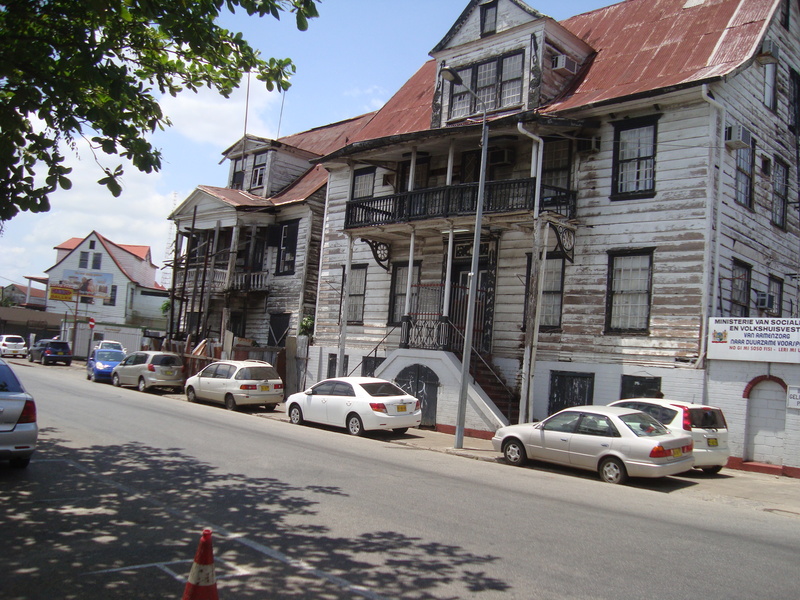 Fort Zeelandia was originally Fort Willoughby – but we lost it! 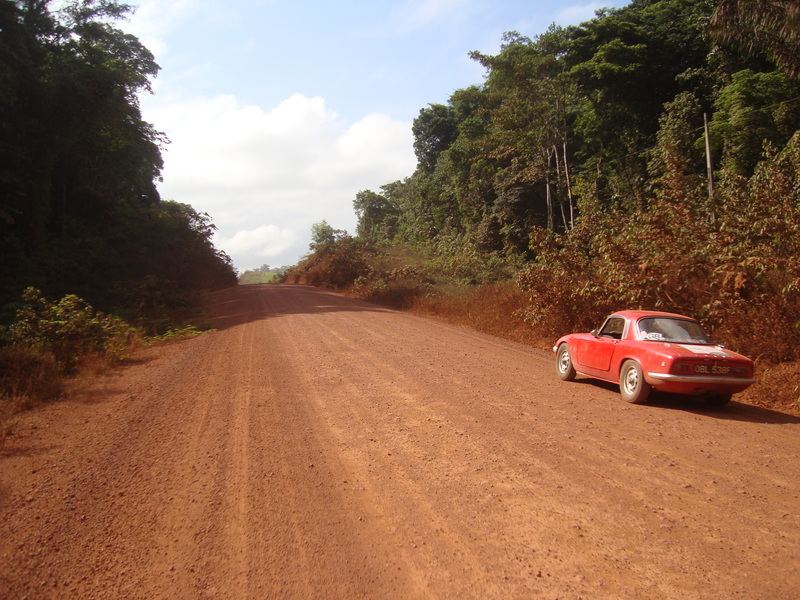 The rally has lost another participant so now we are six – the Elan, Mustang a Mercedes 280 and three 4WD – so that’s one tow car for each of us – we have already started farming out our clutter as the 4WD’s seemed so empty…. 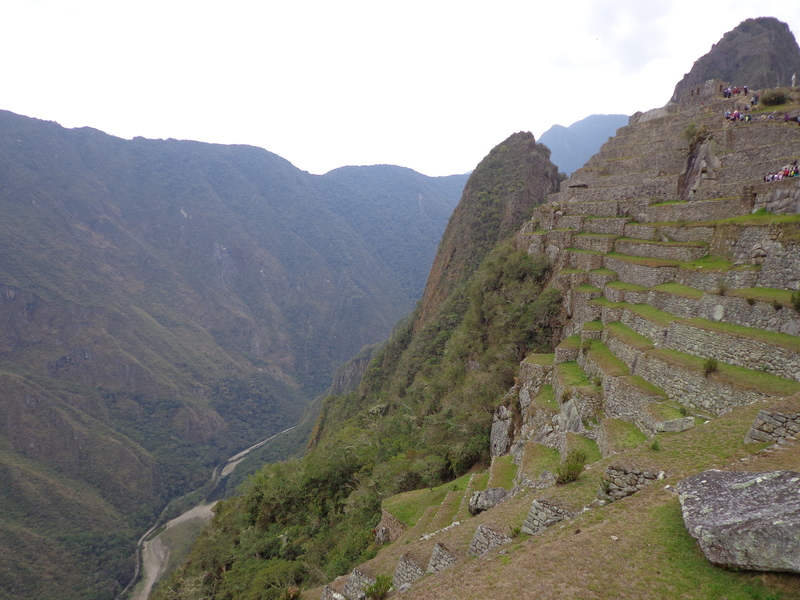 28 days from Surinam to Peru, 4 countries, the Amazon, the Rain Forest, Machu Pichu, Cusco, the Nasca lines, dirt roads, water crossings and the Andes. And a lot more besides! 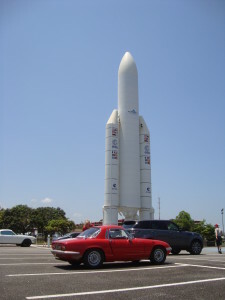 The Elan is already on its way. From little acorns, great oaks grow and the picture shows the last time we saw the car – the scenery can only improve! We drove to Thurrock in the pouring rain with 40 limits on the M25 as there was no visibility. After a stint on the rolling road the engine is much happier, mpg is now mid 30’s – maybe it will stop stopping! Quite a lot of work has gone on recently – sump gasket, crankshaft oil seal, gear box to bellhousing bolt and (an odd one) the O ring on the oil pump. With luck the engine should keep its oil inside and be less generous in sharing it all! The rear springs and front suspension are new as are the brake pads and the water hoses. Just to cheer us all up it seems there are only 7 cars on this rally and 5 are 4×4; that leaves a Mustang and an Elan to represent the Classics! 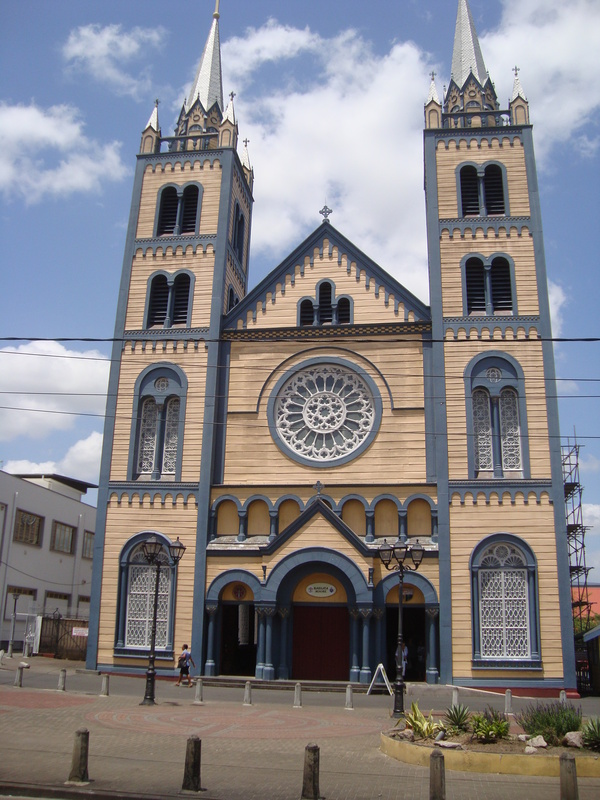 The journey starts in Paramaribo in Surinam, then on to French Guiana. 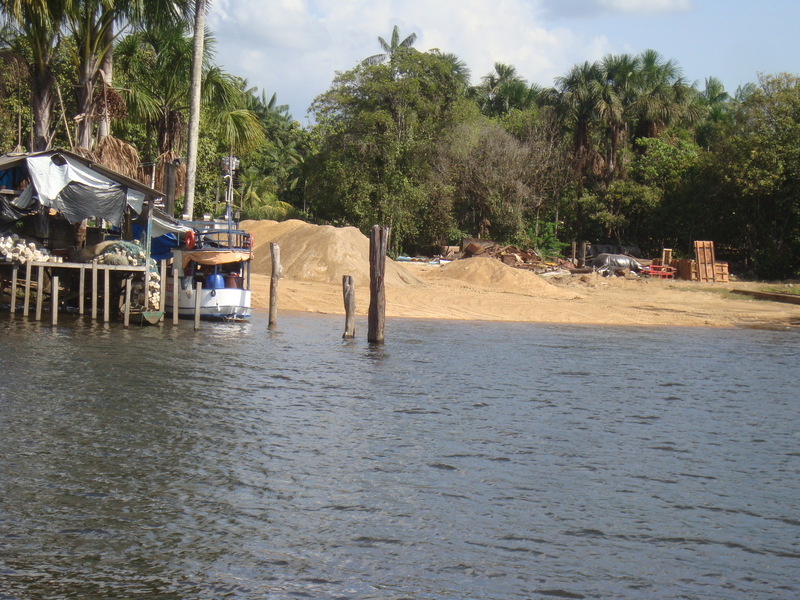 We cross into Brazil and collect an Amazon river ferry from Macapa to Santarem. Then there’s some 2700 kms through Porto Velho and along the Amazon Highway to Puerto Maldanado and Peru. 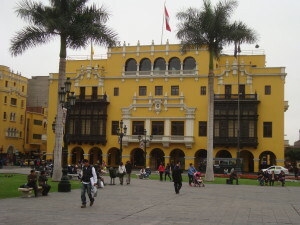 Next stops Cusco and Machu Piccu followed by 1900 kms to Lima, where we end. You are currently browsing the archives for the Amazon Adventure category.